Most slow cookers sold in the U.S. probably do not contain or leach detectable amounts of lead (1). Keep that in mind while reading the rest of this, so you don’t panic. Because some – possibly a significant number – probably do contain detectable lead, and this lead has been found to leach into food (1). The amounts leached are very small, so small that they’re in compliance with federally allowable (FDA) safety standards (1, 3). Phew! No problem then, right? Wrong: The current medical consensus is that there is no safe level of lead, especially for children, who absorb a much higher proportion of it than adults and are more vulnerable to its effects, serious neurological damage being chief on a dreadful laundry list affecting every organ. Lead accumulates in the body, so small exposures can add up gradually over the years (2). In the last decade researchers have found that much of the harm done to children occurs at extremely low levels of exposure. Nor is it great to expose adults to low levels of lead, especially pregnant women (2). It appears that FDA standards are out of date. Currently available over-the-counter test kits are NOT sensitive enough to detect levels we’re talking about here. You’d have to go to a private lab where they have X-ray fluorescent guns and spectrometers and can do an ASTM C738-94 extraction test and whatnot (1). And even if your pot is not leaching now, what about down the road, with use and wear? So it’s a no-brainer, right? Drop the crock pot! Who needs more lead than we’re already getting? End of story. Oh, but you don’t know me, do you. If you did, you’d know that I’m going to give you the counterargument. Because, yes, there is one to be made. Or at least a qualification. And if you do know me, then you know that if there’s an argument or a qualification to be made I’m gonna make it, whether anyone wants to hear it or not. This mental rigidity could well be because I’m one of those people born between 1945 and 1971, who, thanks to leaded gasoline, have astronomically higher body levels of lead than people born after that period, levels 300 to 1000 times higher pre-Columbian indigenous people (5). It may also be because, dammit, I love my crock pot. That’s right. I couldn’t let go. And because I couldn’t let go, I waded in deeper. Why and how you might still use a slow cooker, and the safest way to buy and use one. Everything thought you didn’t need to know about California Proposition 65 and porcelain enamel coatings. Crock pot alternatives. Because you still gotta slow cook. (Hint: cast iron, enameled if you can afford it, non-enameled if you can’t; people slow cooked before crockpot, and once again a tradition has it right). Perspective on lead & heavy metals that will once again lead you to the inexorable conclusion that good nutrition is the best defense against the toxic soup of continuous multiple low-level exposures in which we are today condemned to swim, whether we get rid of our crock pots [whimper!] or not. I’m basing these carefully qualified assertions on two sources. The first is investigative reporter Bill Gephardt’s remarkable series on lead in foodware, aired on KUTV in Salt Lake City in December of 2007. It’s a story that bears retelling, especially as it’s no longer available on the web. Following the alarming results of his initial investigations into lead in dishes, Gephardt, prompted by a viewer who alerted him to high levels of lead found in her crock pot at a fairgrounds test, took a small random sample of ten or so slow cookers to a private lab (admittedly a small sample, but then investigative reporters don’t have FDA budgets). There he found at least two crock pots contained measurable amounts of lead, suggesting in a preliminary sort of way that something like 20 percent of the product out there might have detectable lead in it – and of course that something like 80 percent might not. Gephardt then took the viewer’s crock pot to another private lab to undergo the standard FDA test for leaching. The result was leachable lead at 0.85 parts per million. Perfectly legal by FDA standards of 1.0 ppm for “large ceramic hollowware” (http://www.fda.gov/ICECI/ComplianceManuals/CompliancePolicyGuidanceManual/ucm074516.htm). But unacceptable by recent medical standards (see below). Though Gephardt’s samples weren’t big enough to be conclusive, they were big enough to be suggestive. But no one is going to undertake massive testing or modifying of a product containing levels the FDA already considers acceptable. In the best of worlds, the FDA would have tightened its standards after 2005, by which time medical research had established the need to do so. To its credit, the agency has done so a number of times in the past, keeping up with the increasingly worrisome findings on lead since the 1930s. But this isn’t the best of worlds, not these days. So now you know why my terms are so qualified – “probably,” “possibly,” “something like.” In a world of as-long-as-inadequate-government-standards-are-met-no-one-has-any-idea-what’s-in-there-and-no-one-has-the-money-and-resources-to-systematically-look, one lone reporter is all I’ve got. Gephardt’s series inspired Utah Representative Jim Matheson to seek U.S. labeling legislation. In 2009 Matheson managed to get some labeling for ceramic foodware into federal law: “This product is made with lead-based glaze consistent with Food and Drug Administration (FDA) guidelines for such lead.” No doubt the mild-to-the-point-of-misleading “warning,” which sounds more like a reassurance, that emerged from the legislative sausage-making does not honor the congressman’s original intentions (http://matheson.house.gov/index.cfm?sectionid=49.12&itemid=182). I am indebted to the blogs “Insightful Nana” (http://insightfulnana.com/home-garden/housekeeping-home-garden/lead-poisoning-and-crock-pots/html) and “Green Fertility,” (http://greenfertility.blogspot.com/2008/03/lead-in-rival-crockpots.html), and to natmommy.com of the Mothering.com community (http://www.mothering.com/community/t/852699/crock-pots-and-lead/20), for bringing Gephardt’s crock-pot segment to my attention. The latter two posted excerpts of the KUTV web text for Gephardt’s original stories, which are no longer posted on the station’s website or elsewhere and would otherwise have been lost to anyone not willing or able to pay a private service for video clips or a subscription database. Because I had no original copy, I emailed Gephardt the excerpts of the text; he confirmed their accuracy, for which I thank him here. Gephardt is still steamed about the lack of labeling in Utah and the rest of the U.S. except California. “Let people eat chunks of lead if they want to. But they should know it’s there,” he said, adding, “You just don’t have to use lead in these products. It’s micropennies cheaper.” As for FDA standards that legalize medically unacceptable lead levels, he had a choice word not printable in a family blog. My second “source” is more like a suspicion: the simple inference you can make from the gap between current medical consensus (see below) and the current regulatory standards (see below), plus the fact that food is heated in crock pots for long periods of time, often under acidic conditions. And while the standard leach test is a longer period (24 hours), it is only done at 80 degrees F, while a crock pot gets three times as hot. 2. Current medical consensus is that harm to children from lead occurs at very low blood levels, well below the previously defined (1991) CDC “level of concern” of 10 micrograms per deciliter. Indeed, a great deal of the damage done by lead appears to happen at below 10 micrograms/dL, starting measurably at 1 microgram/dL, with no safe level found. Kosnett, Michael J., University of Colorado, Denver. “Health Effects of Low Dose Lead Exposure in Adults and Children, and Preventable Risk Posed by the Consumption of Game Meat Harvested With Lead Ammunition,” http://www.peregrinefund.org/subsites/conference-lead/PDF/0103%20Kosnett.pdf. This article is useful because it looks at levels and vectors comparable to the FDA maximum allowable leachable lead level for crock pots. 5. Historic blood levels: Issacs, Steven, “Where Public Good Prevailed,” The American Prospect, July 19, 2001, http://prospect.org/article/where-public-good-prevailed and The Franklin Institute website resource page, http://www.fi.edu/learn/brain/metals.html. I was going to use this first post of the year to sing the praises of the crock pot. It was going to be all about how the slow cooker (to use its non-trademarked name) is an easy way to make nutrient-dense meals that demand amazingly little time, effort, money, and carbon, using modern technology to get traditional results. Slow cooking is among the healthiest ways to cook what you’re not going to eat raw. 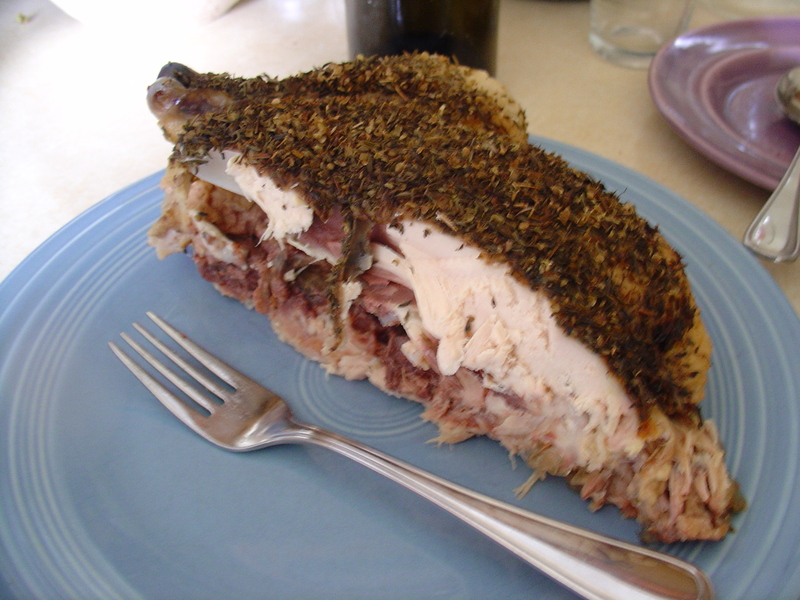 The low heat preserves nutrients and gently breaks down food for maximum digestibility and minimum generation of carcinogenic, inflammatory, oxidizing compounds and effects – that tongue-twisting litany of heterocyclic amines, polycyclic aromatic hydrocarbons, acrylamides, denatured proteins, advanced glycation end products, and free radicals spawned in the demonic hell of high-heat, rapid cooking (1). I’ve been evangelizing about the crock pot for a number of years now as the best way to slow cook, provided you take care not to overcook. It’s the most energy efficient, the most precise, the most forgiving, the easiest to clean up; the smallest footprint in every way. It doesn’t heat up the house or set it on fire. You throw things in, leave for the day and come back to a hot meal that’s pleasurable and comforting enough to keep you from calling for take-out. It’s a staple of my cooking routine, and an invaluable aide to keeping that resolution you all made to eat more home-prepared whole foods. I love to tell people how you can make a whole chicken deliciously cooked in its own liquid, an effortless gourmet meal that exemplifies my recommended mantra for those who think they don’t have time for real food: “don’t cook; assemble.” (I don’t know who first came up with that, but it’s genius.) How, contrary to reputation, crock pots can create some fine aesthetic effects if used skillfully — not the tasteless mush some foodies complain about — and without the health-defeating browning prep some think necessary. How it’s the best way for lazy cooks like myself (I prefer to be described as “labor-sensitive”) to handle grass-fed meat and inexpensive cuts; to finesse tough prospects like duck, or scary ones whose original identity you may prefer to blur in a stew, such as organ meats, bunny rabbits, or, I’ve been thinking lately, those back yard squirrels that keep digging up my patio planters. I go on and on about how crock pot cooking gets all the meat off the bone and makes mineral-packed bone broth while you wait. About how nicely it renders lard and fat, capping off the efficient use of the whole animal – bones, organs, fat and all, the only respectful way to use life if you’re going to take it; nothing wasted. Yet not too messy for the faint of heart. And I’m still going to tell you all that. But as I was pulling up my chair to get started, I checked my email in a last burst of procrastination, and there I found some disturbing information. 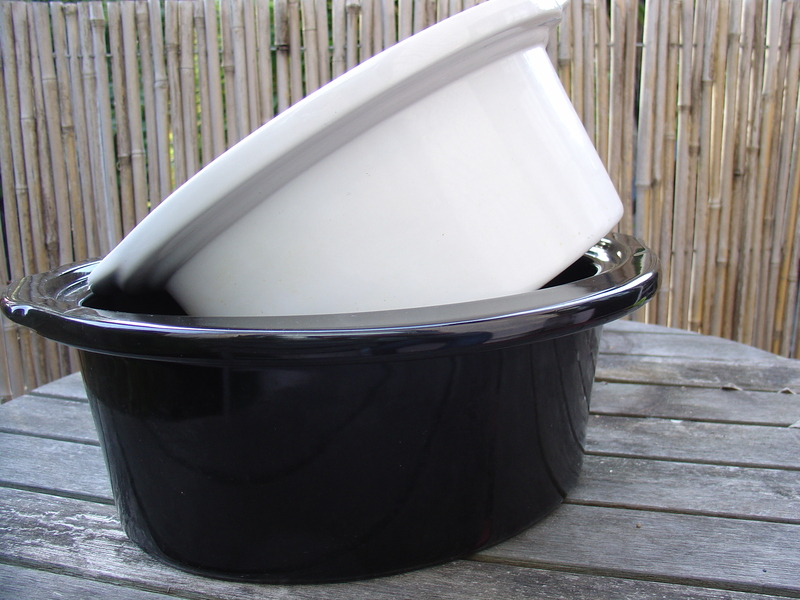 People on the Weston Price yahoo group were wondering how to find a lead-free crock pot. Lead-free? Crock pots have lead in them? My head whirled. Was I poisoning myself with my favorite modern convenience? Would I have to change my whole way of doing things? 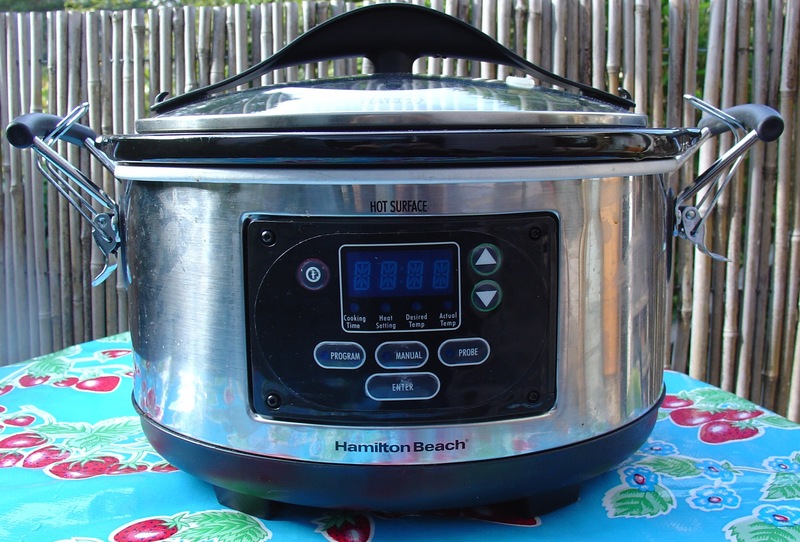 Worst of all, was I going to have to explain to the clients, friends, and family who had bought crock pots on my advice that they should now get rid of them? Well, maybe. And maybe not. In Part II, I’ll tell you what I found. And get to some recipes. Stay tuned. Don’t throw anything out or run out and buy anything new just yet. 1. See hundreds of studies in the past 30 years; try searching PubMed (http://www.pubmed.gov/) using key words from this paragraph. U.S. research tends to single out red meats cooked at very high/dry heat, but in fact most heat-processing, i.e, cooking, of most foods involves some harm production and nutrient loss (see Jägerstad, M. “Genotoxicity of Heat-Processed Foods,” Mutation Research, July 1, 2005, 156-72, http://www.ncbi.nlm.nih.gov/pubmed/15914214 and other studies from abroad, as well as studies on acrylamides and AGEs). Does this mean you shouldn’t cook food? Raw foodists say yes, but I say no, and I’ll be telling you why in future posts. 2. Learn more about Weston Price at http://www.westonaprice.org/. Must you buy all organic? As a holistic nutritionist, sustainability buff, and wellness exemplar to the world, you would think I myself would buy only organic produce. So do I? Well, no. Sure, USDA organic certification tells you that produce is grown and handled using no synthetic fertilizers or pesticides, and that it has been inspected by an accredited certifying agent who has verified that this is so. (See http://www.epa.gov/agriculture/torg.html and http://www.ams.usda.gov/AMSv1.0/getfile?dDocName=STELPRDC5068682 to learn more). But that’s no guarantee that produce is seasonal, local, fresh, or produced with fair labor. And then there’s the 800-pound gorilla in the room: price. Organic certification can be costly for farmers, especially small ones. So while it enables me to know what I’m getting, it also raises the prices of very producers I’m interested in, the small and the local ones. A little mindfulness goes a long way. Nothing is perfect, but once you’ve informed yourself about standards, established your personal priorities, and accepted your budget, the choices become surprisingly easy. I sometimes buy from local farmers who claim to farm organic “under the radar,” keeping their prices down by using organic methods without official certification, especially if they give detailed, forthcoming answers to my questions. But short of perfect oversight by the operating organization (a good reason to shop at farmers markets and grocery stores you trust, and ask plenty of questions), I have to just basically take the word of the person answering the questions, which has its limitations. It’s also unfair to producers who are paying the certification fees and undergoing inspections. I also sometimes buy from those who are partially organic (technically that’s like being partially pregnant, but pesticide-free would be an example of what I mean) or on their way to being certified. The latter often means they’re farming on soil that hasn’t yet been organically farmed for the required number of years (usually 3 for USDA). That can mean chemical residues in the soil, but it’s still a far cry from conventional. When my money runs out, I’ll also buy certain items conventional – those that are on Environmental Working Groups’s “Clean 15” list and not on their “Dirty Dozen” (http://www.ewg.org/foodnews/summary/), which of course addresses the health issue and the price issue but not necessarily the environmental/political one. According to EWG, you can cut your pesticide load by 92 percent by consuming conventional “Clean 15” produce and avoiding the “Dirty Dozen,” buying organic only when the conventional is on the dirty dozen list. That’s compelling enough for those on a tight budget. If you can’t afford to buy all or mostly organic this is a great way to save money. But when I buy conventional, I do try to keep it local – easy enough to do in California. Since reading about the huge amount of lead in some local soil (http://www.eastbayexpress.com/ebx/how-safe-is-your-soil/Content?oid=2947105), I won’t buy urban garden produce unless I know they’ve tested and, if necessary, remediated, and exactly how. You’d be far better off with pesticides, herbicides, and GMO than with lead. To understand what organic means, visit http://www.epa.gov/agriculture/torg.html. For EWG’s “Dirty Dozen” and “Clean 15” lists, visit: http://www.ewg.org/foodnews/summary/. Phat Beets (http://www.phatbeetsproduce.org/) is an Oakland nonprofit dedicated to providing affordable access to fresh produce though the creation of farmers’ markets and youth-powered gardens. They run three farmers’ markets in North Oakland. The farmers are all small and local, and I filled my usual shopping basket with extremely fresh produce for about 40 percent less than it would have cost me at the major organic farmers’ markets in Oakland and Berkeley. Not all the vendors are certified organic, however. In fact, most are not. Many are in the process of certification; others provide various combinations of partially organic (e.g., pesticide-free) and what’s ultimately pretty much conventional (see vendor guide, below). That doesn’t mean what’s on offer is not worthwhile or no better than conventional supermarket produce: it’s still local, fresh, affordable food that benefits the community and leans towards organic. But problem is there’s not much information provided about what you’re actually getting on a given item, and vending staff wasn’t able to provide much detail the day I was there. Phat Beets isn’t making any false claims. They just want to get lower-income people fresh, local food from small local producers, and that’s what they’re doing. But if you’re looking for a deal on organic at a Phat Beets market you should use my vendor guide to know what you’re buying. Part of what you’re paying for at the seemingly boutique-priced farmers’ markets like the ones the Ecology Center runs is organic certification and some degree of verification and transparency for methods used on non-certified food. Organic certification is no guarantee that produce is seasonal, local, or produced with fair labor, and those are important considerations, too. But that’s no reason throw up your hands in despair and just buy whatever’s cheapest as the conventional agricultural industry would have you do. I’ll shop again at Phat Beets, especially the Tuesday market, which features the 100-percent certified J & P Organics. But I’ll be sure to take my vendor’s guide with me. Vang Family Farms. Clovis/Fresno, CA. Not certified organic. They use DiPel (http://www.valentbiosciences.com/docs/pdfs/learning_center/LC_DiPel.pdf), an organically-approved pesticide, to control pests in their tomatoes, and organic fertilizer. But they also use Roundup between rows and before planting in addition to hoeing and hand-weeding. So I guess you could call them semi-organic – probably better than supermarket conventional, but not organic. See http://www.ecologycenter.org/bfm/vendors/farm-facts.php?vendor=Vang%20Family%20Farm&id=10277. Firme Farms. Stockton, CA. In process of getting organic certification (they say by end of 2011). Wide variety of veggies. See http://www.firmefarms.com. J&J Farms. Hughson, CA. Not certified organic. Phat Beets says J&J grows oranges and tomatoes and pesticide-free stone fruit. I take that wording to mean the oranges and tomatoes are conventional, so I might buy the pesticide-free stone fruit (not organic but closer to it) but not the oranges & tomatoes. However, other farmers are offering organic oranges and tomatoes; you gotta ask which farm the stuff comes from to know what you’re buying. See (http://jandjfarmsca.blogspot.com/ & http://www.phatbeetsproduce.org/farmers-markets/north-oakland-children’s-hospital. Scott’s Family Farms. Fresno County, CA. In process of getting organic certification. Farmer Will Scott is president of California Assoc of African American Farmers. He farms without synthetic fertilizers or pesticides. Various fruits and veggies. See http://www.phatbeetsproduce.org/order-a-beet-box/scotts-family-farm/. 747 52nd St (Children’s Hospital), 2 to 7 p.m. Tuesdays. The Tuesday Phat Beets Market has J&P organics, which says it’s is all certified organic (http://www.jporganics.com/). They also have J&J Ramos, which is mixed, so watch which one you’re buying from if your priority is certification. 675 41st Street (St. Martin de Porres Catholic School) 2:30 – 5:30 Wednesdays. Supported by the school. The farmers are not listed on Phat Beets website; whether it’s the same farmers as above or produce grown by the school or both or some other deal is not indicated.